Be careful Americans! “Big Brother is watching you". George Bush by authorizing secret spying on Americans has led his country to an Orwellian society. Bush's post- 9/11 governmental policies are close to George Orwell's dystopian vision in his book “1984”. In a weekly radio address, US president George Bush has admitted spying on Americans after 9/11. He has authorized the National Security Agency (NSA) to eavesdrop on US citizens and foreign nationals in the United States. Bush has gone on the offensive over accusations that he abused his executive power by allowing the secret wiretapping of Americans without a court warrant. The super-secretive NSA, which has generally been barred from domestic spying except in narrow circumstances involving foreign nationals, has monitored the e-mail, telephone calls and other communications of hundreds, and perhaps thousands, of people under the secret-spying program, the New York Times disclosed on Friday. 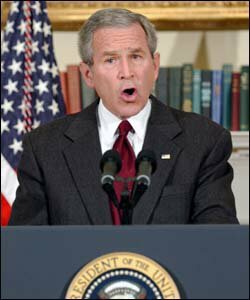 After 9/11, the Bush government has launched a ferocious campaign against the enemies of 'life, liberty, and the pursuit of happiness', a campaign that it called “War on Terrorism'. One of the first actions taken by the Bush administration to protect America from another attack was to ask Congress to pass the Patriot Act. The Patriot Act aimed at expanding the authority of the federal government on such fronts as information sharing, obtaining private records and conducting secret searches and roving wiretaps in its effort to track down suspected terrorists. As it was about to expire by the end of this month, a group of US senators, demanding increased protection of civil liberties, defied President George Bush by blocking, on Friday, the renewal of the Patriot Act, a centerpiece of Bush's 'war on terrorism', depicting the measure as a threat to the constitutional liberties of innocent US citizens. Fifty Republicans and two Democrats unsuccessfully voted to end debate on the renewal legislation. However, five Republicans, one independent and 41 Democrats blocked it. The deadlock marks an increase in tensions between the administration and Congress over Bush's anti-terrorism and surveillance policies and the conduct of the war in Iraq. For his part, President Bush has accused senators of endangering American lives by filibustering renewal of the Patriot Act and railed against the illegal disclosure of a classified eavesdropping operation. In post-9/11, America, through its Patriot Act, has turned into a police state on the pretext of 'protecting' civil liberties. In fact, the provisions of the Patriot Act follow the same reasoning of the Big Brother society as depicted in Orwell's '1984'. In Orwell's society, a person can be arrested not just for public speech, but for his/her private thoughts as well. In America this concept was incarnated in the Patriot Act. The Bush administration has embraced the same mottos of the Big Brother: Freedom is Slavery; War is Peace; and Ignorance is Strength. Orwell's book depicts a society dominated by a totalitarian government in which citizens' liberties are suppressed on the basis of an endless war. The same thing is happening in America. Bush is allowing “sneak-and-peak” searches on US citizens and non-citizens alike for an endless war, 'war on Terror'. The US has been seizing power, and subordinating the civil rights in the name of national security. So, be careful Americans! Big Brother is watching. They read your private e-mail correspondence, monitor Internet usage, tap into phone conversations, delve into computer files and conduct searches of homes and offices without immediately, if ever, presenting residents with a search warrant. Law agencies who apply provisions of the Patriot Act in the pursuit of terror suspects don't have to justify their actions to a court. By validating any investigative act under the guise of "national security," law enforcement could potentially abuse its power in any number of ways, with very little recourse for those under scrutiny. For these reasons, many in Congress would like to see the Patriot Act renewed, but with changes. The ability to root out and stop terror organizations is crucial, but the law should stop there. Any mandate that gives government the authority to harass its citizens with no checks from the courts violates Constitutional rights. Naima Gouhai, 30, a Moroccan expatriate in Tuscany, Italy, seeks to be the first woman Imam in Italy, after American Amina Wadud had broken with Islamic tradition by leading the Friday prayer service in a New York chapel, where men and women sat together. This issue was raised last month by the Milan-based daily “Corriere Della Sera”. According to the paper, Gouhai – nurse and mother of three children – applied for the Imamat at a local mosque in Tuscany two days after Wadud had led the Friday prayer in NY. Amina Wadud, an associate professor of Islamic studies at Virginia Commonwealth University, led the Islamic weekly service, where 50 men and women prayed behind her, after she had delivered the sermon, thus defying basic Islamic rules. Naima Gouhai told the Corriere Della Sera that “it is not a problem for a woman to become Imam if she is more qualified than a man to lead prayers”. Firas Jabrin, an Imam in Tuscany also saw no problem in her being an Imam. He also said that she could come to the mosque where he is leading prayers. However, many of the 1,500 Muslim in the area have refused to accept a woman Imam. Abdelbari Zamzami, an Imam and a religious researcher, told Morocco Times that “a woman Imamat is not totally forbidden in Islam. That's why some prominent religious scholars enabled both men and woman to be Imams”. “Throughout history Muslims did not need a woman Imam to lead prayers, because men were enough”, he said adding that “there is no Prophet's sayings forbidding women to be Imams”. Zamzami said that what happened in America is not accepted, referring to Amina Wadud leading Friday prayers. “A woman should be covered up while praying, but what we have seen in America is different. Women prayed with their hair uncovered, wearing Jeans, which contradicts with praying requirements,” said Zamzami. Mustapha Rmid, a leader in the Justice and Development Party, said that “Throughout history, there was a consensus that a woman cannot lead men and women in prayer”. He added that this is not “an important issue to discuss”. Al Mustapha Moatasim, leader of 'Al Badil Al Hadari Party', said that “there is nothing in the Koran that forbids women from being Imams and that some religious scholars allowed them to lead women in prayer, but not men”. Dr Abdelhadi Boutaleb, member of the Academy of the Moroccan Kingdom and a researcher, favours men Imamat but said that a woman can lead prayers for women. “Wadud masters Islamic teaching; she was reciting the Koran properly, and was wearing descent clothes, respecting Islamic prayer traditions. However, the women who were praying behind her were not covered up, which is against Islamic teachings,” said Boutaleb. Woman Imamat raised heated debate among Muslim communities around the world. Some claim that Islam bans women from leading women and men and that the congregation should only be made up solely of women. Others see no problem in a woman leading men and women. 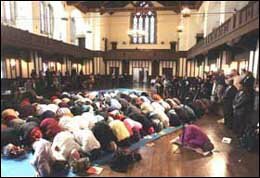 Qatar-based Sheikh Yussef Al-Qaradawi, an influential Muslim cleric said that “Prayer in Islam features getting up, sitting down and kneeling...It is not befitting for a woman to make these movements in the presence of men when worshipping requires a peaceful mind and concentration on communicating with God." But Egypt's Grand Mufti, Sheikh Ali Guma, declared that woman-led prayer of mixed-gender congregations is permissible, so long as the congregation agrees to it. Casablanca -- Aïcha El Bihi, a Moroccan woman in her early 40s, had been abducted by her husband Abdelrrahman Ibn Mamoun al-Aârbi, alias Abdelrrahman Bennani, and imprisoned for 12 years in an abandoned house in one of the villages in Safi in south Morocco. Aïcha's case was discussed in Moukhtafoun (The disappeared), aired on 2M channel seven weeks ago. The lawsuit filed by her brother Abdelrazak El Bihi against her husband is currently before the first instance court in Safi. The hearing is due on September. Moukhtafoun (The disappeared), has become one of the top viewed TV programmes in Morocco. Moroccans of all ages and social background await impatiently the broadcast of the programme, aired every first week of each month. Last April, it has reached a viewing total of 13 million. Moukhtafoun, as its presenter Adil Benmoussa calls it, is a social programme featuring true stories of people who have disappeared either in Morocco or abroad. “We have many cases of people who have disappeared for a long period of time, commonly with no known reason. We display their faces on photos with a phone number to call if someone sees that missing person,” said Benmoussa. Benmoussa said that they receive hundreds of calls every day from Moroccans looking for their missing relatives or friends who have disappeared for several reasons. “Some were kidnapped, abducted, detained, illegally immigrated to Spain or Italy, abandoned, runaway or simply moved without notice,” said Benmoussa. “The programme is very successful because it is very close to the public. We have been following many cases of disappearance and we have broadcast people's reunion when they found their missing ones,” added Benmoussa. Moukhtafoun receives hundreds if not thousands of emails everyday from people all around the Kingdom explaining their problems and asking for help to find their relatives or friends. “It is a very hard job to deal with the so many letters and calls we receive. We have to select urgent letters and classify them in themes, contact the people who requested our help, do our reporting, and follow closely the case of the person who disappeared,” stressed Benmoussa. “After carrying out our investigations, we work on the person's profile, who is he, where and how he lived, how he disappeared, listen to his family, and friends. That makes the story more newsworthy. And through the programme, many families were able to find their beloved ones, which is very touching,” he said. As for the challenges facing the Moukhtafoun staff, Benmoussa said that the biggest problems they have are the sources of information and the slow administrative procedures. “Many times, we have problems concerning the credibility of our information sources. Those looking for their missing ones, often do not tell us the whole truth for us to be able to help them. Or they don't have enough information that may help us in our research and investigation,” said Benmoussa. He added that administrative procedures might also be a stumbling block, preventing them from speeding up the search process. “We certainly deal with police departments, hospitals; we need to get authorization for ADN tests for example, authorization to shoot in certain places...and these are the major challenges we currently face,” he said. Moukhtafoun has recently broadcast a very touching story of a woman who was abducted by her husband and imprisoned for twelve years in a remote and abandoned place in south Morocco. Moroccans were shocked by the story and closely followed it as the programme broadcast the hearing of her husband after he was arrested for inhumanly detaining his wife. “This is a very sad story; the woman's husband imprisoned her for quite a long time and abandoned her until she got very sick. We were called by her brothers to offer help. Her husband is very violent and he even attacked us when were shooting the hearing,” said Benmouss. Abdelrazak El Bihi, who is currently living in London, had not seen his sister Aïcha for more than 15 years. Back home, he discovered that she has disappeared, and that nobody knew where she was. He went with his brother Habib to meet Aïcha's husband, but weren't able to see her. Her husband pretended she was in Casablanca seeing some of his relatives. After investigation, they found out that she was imprisoned in an abandoned house in Ouled Ali Kiyada Al Amer in Safi, south Morocco. Enthusiastic, anxious and concerned, Abdelrazak is only seeking justice. “I want this man to be tried, and I want to take my sister to be treated in a hospital either in Morocco or England. My sister has become mentally ill and she needs urgent medical treatment,” said Abdelrazak. Aïcha El Bihi was born in 1956 in the Safi region. She moved to Marrakech with her family at the age of four. She was closed to herself, and had a very traditional life with no experience or contact with the outside world. In 1979, her father died, followed by her mother in 1981. Alone, Aïcha found herself responsible for raising her three brothers and three sisters. Her mother was quite rich and left her lands and belongings before she died. Illiterate and naive, Aïcha was unable to manage the funds. While she was going around her lands to find out how much she had, she came across her current husband who was working indirectly with his brother at her land as a farmer contractor. Abdelrrahman (her current husband) proposed to help her in accounting. “Since he and his brother were working for my family, Abdelrrahman was seeking any opportunity to control all my sister's money and lands,” Abdelrazak El Bihi told Morocco Times. “My sister didn't like him at all. We just can't understand how the marriage happened. It was very mysterious as nobody attended the wedding, not even her brothers and sisters,” added Abdelrazak. Nobody in El Bihi's family believed that Aïcha could marry such a man as he was already married to two others and had seven children. After the marriage in 1987, Abdelrrahman sought to be the guardian of her young brothers and make sure he controlled her money and that of her small brothers'. However, the court refused to grant him the guardianship. Abdelrrahman changed his surname to Bennani (a surname of a big and well known family in Morocco), controlled around 120 hectares of his wife's lands and prevented her brothers and sisters to benefit from their inheritance. Aïcha's brothers and sisters filed a legal suit against him, demanding their share from the assets they inherited from their mother. It took them several years to get their legal share from him. Since then, Aïcha's brothers and sisters lost sight of her. They knew she was in Safi, but ignore where she is exactly. “My first meeting with my sister was in 1992 when she fled her husband's house. She went to her cousin in Safi, and phoned my sisters, who brought her back to Marrakech. She was very sick,” said Habib, Aïcha's younger brother. “After talking to her, we found out that she is suffering from psychological problems due to her husband attitude and behaviour. He treated her like an animal,” emphasized Habib. Aïcha was then transferred to the hospital for medical treatment. She got well, but didn't stop asking for her three-year old child. Two months later, Abdelrrahman came with the little son to ask for her. Aïcha was depressed to learn that her son didn't recognize her. She told her brothers and sisters that Abdelrrahman used to beat her and lock her in the house and that she didn't want to come back to him. Relatives and friends helped in their reconciliation, and Aïcha came back with him. Since that time, she disappeared completely. “Whenever we had the opportunity to ask for my sister, he gave us a ready-made answer that she is here and there, and we have never managed to meet her for more than 12 years until my brother came last January from London,” said Habib. After investigation, the 'Gendarmes' (usually in charge of policing of countryside areas and of small towns) went with Aïcha's brothers Abdelrazak and Habib to identify where she is imprisoned. The Gendarmerie had located an abandoned house in Ouled Ali Kiyada Al Amer in Safi. They knocked at the door but nobody answered. They kept knocking until a woman responded yes. The house was like a detention cell locked with an iron chain. “You could see from the half locked door that there was no furniture in the house as police reports confirmed. Aïcha used to sleep alone all these years on the soil. The house was like an animal farm,” explained Habib. Police reports said that Aïcha's words were not understood. Neither the Gendarmerie nor her brothers figured out what she was telling them, and concluded she might be mentally sick. The Gendarmerie came back to look for her husband, but he refused to come and used violence against them. Abdelrrahman got arrested but was released 20 days later. Instead of taking Aïcha to the hospital, the Gendarme handed her over to her son who is under 18. In turn, her son took her to his father's house. “The Police and the judge sent my sister to hell again. I am shocked. When I asked the judge why they freed her husband, he answered: she is his wife and he brought medical certificates that she is being treated elsewhere,” said Abdelrazak. “Is this the law, is this justice?!! Of course the certificates are falsified. Even her son neglected her and followed what his father told him. My sister is in high need of medical treatment. What happened is inhuman,” added Abdelrazak. There have been four hearings up to now with no efficient results. The next hearing is due on September. Several women organizations have recently staged a sit-in in Safi before the house where Aïcha was imprisoned. Her brother Abdelrazak has sent many letters of complaints to the ministry of justice, the ministry of foreign affairs, the prime ministry, but in vain, status quo. Depressed and frustrated, Abdelrazak said if the Moroccan court wouldn't allow him take his sister to be treated in the hospital, he would resort to international human rights organization. Temara---"Quli Taslim" (submit to the power of Jinns). I was asked to say so at the entrance of a fortuneteller's house, located in Temera on the outskirts of Rabat. The house of Fatima Zohra was full of people from all walks of life who came to ask about their future, their relationships and their work. Fatima Zohra's house was very chic, though located near a shantytown in the area. There was a waiting room for guests, and an office with a telephone and a secretary. My colleague and I were so stirred by what we saw. "Wow, it seems that she is richer than Bill Gates," I told my colleague laughing. "Don't forget, you are my translator and I am Madam Lopez, beware of the slip of the tongue," I added. In a taxi, before coming to see the fortuneteller (Shawafa in local dialect), we were searching for a lie to tell the Shawafa. We couldn't tell her that we are journalists and coming to do an investigative reporting on witchcraft in Morocco. So I chose to perform the character of a rich American who has been deceived by a Moroccan guy. My colleague should play the role of my translator as I am supposed to know only few words in Darija. I thought it was a funny game. We started thinking about a name. As we were listening to a Jennifer Lopez song, we decided that I should be named Madam Lopez. Before getting to the Shawafa's house, we had mixed feelings: phobia and amusement. We hesitated before entering the house. I burst out laughing and I told my colleague: "Come on, my translator. Let's get into this adventure." At the waiting room, we were scanning everything around. I was busy chatting with my colleague until I heard "Madam Lopiiiiiiiiiiiiiiz" with a countryside accent. The Shawafa was in her twenties. Her office was very tidy and organized. In the corner of the room, were many hjabat (talismans), magically charged objects used to attract a certain type of energy or a particular type of person. "Bojor Madame Lopiiiiiz," said the Shawafa in a Moroccan-countryside way (Bonjour Madame Lopez in French). Fatima Zohra told my 'translator' to ask me to put an egg next to my heart and think about what I want to know. I concentrated on the story of the Moroccan guy who was supposed to have deceived me. Fatima Zohra told me about a guy that I had never known. My colleague and I found ourselves deeply involved in the 'show'. "Madame Lopiiiiiz, rah andak laakas (you are unfortunate, and cursed). Someone has cast spell on you. Tell me; do you have any of his clothes, or anything of his belongings," said the Shawafa. "Ok, what's his name and his mother's," she asked. I looked at my supposed translator as we both didn't think about this question. My colleague answered quickly: "Morad wald Khadija". As my colleague was talking, the phone rang. We heard the Shawafa telling the caller: "Safi gharadak takda, douz aandi bach naatik douk el hjiybat (your wishes are fulfilled, come and take your talismans), said Fatima Zohra. Her phone didn't stop ringing. It seemed that she got calls from all over Morocco and abroad. As she was busy speaking on the phone with her clients, it gave us the opportunity to think about what we want to say next. Our thinking was interrupted with the screaming of a woman in the waiting room. Fatima Zohra jumped from her chair and rushed to the room to see what was going on. "Taslim Taslim, rah lamra tayhouha el msalmine (submit to the power of Jinns, the woman is possessed)," said some of the women in the waiting room. Fatima Zohra asked us to wait in the room until she looked into the case of the possessed woman. "It seems that this day will never end. I don't know how much time we have to wait here. I started having little phobia," I told my colleague. Back to the waiting room, we saw people busy talking about the objective of their visit to the Shawafa, and shared their stories. Amina, 50, said she came to the Shawafa to know about the future of her beautiful daughter. "My daughter is very beautiful, but she is nearly beyond the normal age for marriage. Lots of men ask her hand, but as soon as we agree on marriage, the men leave without reason. This has happened with at least six men and I don't want my daughter to be a spinster," said Amina. "My daughter is psychologically ill and refuses to see anyone who comes to ask her hand, as she knows that he will leave without reason like the others," added Amina. 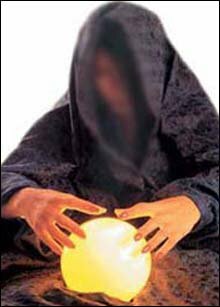 The said mother is among lots of women and men who resort to fortunetellers and Fakha to solve their problems. Leila, another woman in her thirties said she was advised to come here to bring back her husband who no longer cares about her. I felt thirsty. My colleague asked the secretary for a glass of water. She, then showed us the way to the Kitchen. Once there, we were astonished to see several pictures of Khaliji-like men (people from the gulf, middle-east) along with candles of different colours lit on in front of the said pictures. "It's a funny game, isn't it," I told my colleague. As we were watching the pictures, the secretary called us to see the Shawafa. The latter gave me several Talismans, along with a list of things to buy for the Boukhour (a mixture of herbs, plants, and/or essential oils in a flower or wood base that, when burned, is aromatic. Incense has been used for centuries in religious and magical rites). My colleague asked her about the Boukhour. Fatima Zohra said we can either buy them from "el Attar" (herbs vendor) or give her MAD 1000 (about 90 Euros) to buy them for us. My colleague and I were stunned. "What's this Boukhourthat costs MAD 1000," we wondered silently as we were exchanging looks. "No, don't worry, we will buy them ourselves, anything else," my colleague told Fatima Zohra. "No, when you bring me what I asked you to do, I will tell you about the next steps," she said. We gave the Shawafa MAD 200, and left. Then we went to see a Fkih, located in the opposite neighborhood. A Fkih is a kind of witchdoctor. He is a healer who believes that illnesses are caused by magic and are therefore best cured by it, as opposed to science or developed medicine. We were told that in Temara, there are many fortunetellers and witchdoctors. I started feeling a terrible headache. There was a Fkih who has an echo in the area called “al-Mokhtar”. This time we had to perform other characters. My colleague and I performed the character of simple Moroccan women, who are curious to know about their future. At the waiting room, we were surprised to see men who came to see Fkih. We previously thought that this world was only reserved for women. However, it proved to be untrue. We learned that several upper and middle class men resort to Fkih to gain power at workplaces. Some put Talismans in the corners of their offices; others splash coloured water, usually yellow, on the ground of the office. These things influence the people who get in and out from the office. The Fkih was young in his late twenties. The majority of his clients were young men and women who resort to him for their psycho-pathological problems. Consulting a psychiatric or psychologist is not part of the Moroccan culture; only few people do. The Fkih started telling me that I will inherit a big amount of money and that I will meet the man of my life within a period of three months, but I have to get rid of my curse first and blabla blabla. The young Fkih was looking at me in a strange way while giving me Talismans. He told me to do Boukhour for 3 consecutive days, and then put a talisman into water and wash my body, but advised me not to throw this water in the toilet. Instead I should throw it on the grass. As we left the Fkih's house, my head was turning upside and down. “What are we going to do with all these Talismans,” I told my colleague. “Let's burn them,” she replied. “No, we have to read them first and then see what will we do next,” I stressed. I knew it was a mysterious and enigmatic world and certainly very dangerous. However, my colleague and I decided to continue the adventure. The writing on the Talismans was strange, accompanied by tables and some drawings. It seemed that it was written in the language of Jinns (evil demons having supernatural powers). A friend of mine told me there is a woman called Najma who could help us decode the Talismans. The woman in her twenties was also a Shawafa. My friend told me she was possessed by the Jinns who were guarding a treasure buried in a place near Marrakech. Najma was kidnapped when she was 8 years-old to help the Fakha to decode the place of the treasure and open it. Fakha usually use people who are “Zohriyine” (people who have horizontal straight line in their hands, and whose eyes get crossed from time to time) to open treasures hidden in some lands hundreds or thousands years ago. While waiting to see the Shawafa, we heard two women talking about their neighbour who was possessed by Lalla Aicha. “Lalla Aicha” represents a strong and well-wishing spirit fashioned after a local heroine who battled Spanish colonizers. Several people in Morocco believe in various omens and superstitions. They also believe that Jinns rule their lives. The two ladies continued talking, but this time about their husbands. I understood that it was the objective of their visit to the Shawafa. In Morocco, several women do not go to psychologists or marriage counselors (rarely or ever existed), they go instead to see clairvoyants. According to popular belief, a woman who wants to bring back her husband must collect some of his sperm and then give it to a witchdoctor. It was our turn to see the third Shawafa for that day. Najma, the Shawafa, started laughing when she read the Talismans given to us by the Fkih. She told me that they are meant to attract me to the Fkih as he liked me. “If you use these Talismans, you will be obsessed by the Fkih and unable to restraint yourself from seeing him very often,” she said. “Can you help us get rid off these Talismans,” I told Najma. She accepted on condition that we give her MAD 300 (about 27 Euros). I gave her the money as I only wanted to run out of the place and go back home. Suddenly a woman started screaming. I thought it was the same scenario as it happened in the house of the other Shawafa. But I was wrong. This time, it was more serious than before. The lady was in a complete hysteria. The lady started talking a different language with a man's voice. We were asked not to talk, not to laugh and not to move. 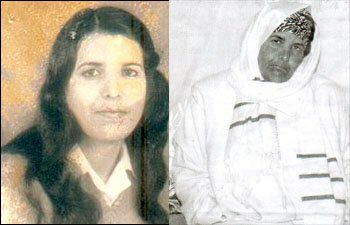 There was a face to face dialogue between the Shawafa and the woman, or the spirit who possessed her as they say. 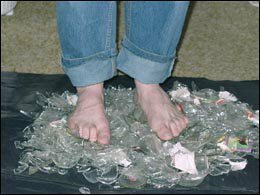 As soon as the Shawafa took the lady in another room, we run away from the house, leaving all the Talismans and everything behind. It was truly a mishap, but interesting to discover a hidden world. We concluded that the Fakha and Shawafat therapies are varied. People use these methods according to their money. Some use the candles to attract the people they love (it costs no more than MAD 50); others use Kouboul (attraction) and it costs around MAD 300 to MAD 500. People also prefer to use Ldoune (sort of metal used to undo bad hex). Those who have a lot of money use Kouboul made up of the hyena's brain, and other herbs (the hyena's brain could cost up to MAD 20,000). Islam bans the practice of sorcery. The religion states that the bewitched person could be cured by using Koranic verses. Muslim leaders preach against it in mosques and denounce sorcery as a pagan satanic rite. Psychiatry also states that hallucination, abnormal visions, strange voices, unbearable pain, and depressive ideas are symptoms of a person who has psychological problems. Yet, several Moroccans still can't help but associating this kind of symptoms with metaphysical beliefs and chose to waste their money and gamble with their lives to see a Fkih or a Shawafa.